The Co-Matic Tabletop Edgebander includes the BR500 Hot-melt Edgebander, Stationary Table, Tape Dispenser, Guillotine, & Straightline Fence Attachment, allowing you to complete edgebanding projects quickly with quality in a tabletop setup. For parts with curves or that are too large to edgeband in the table setup, simply remove the edgebander from the table and finish those parts by running the BR500 Edgebander hand-held. *Edgeband Dispenser has been updated from the white round dispenser to the black dispenser that is adjustable relative to the diameter of the edgebanding coil. 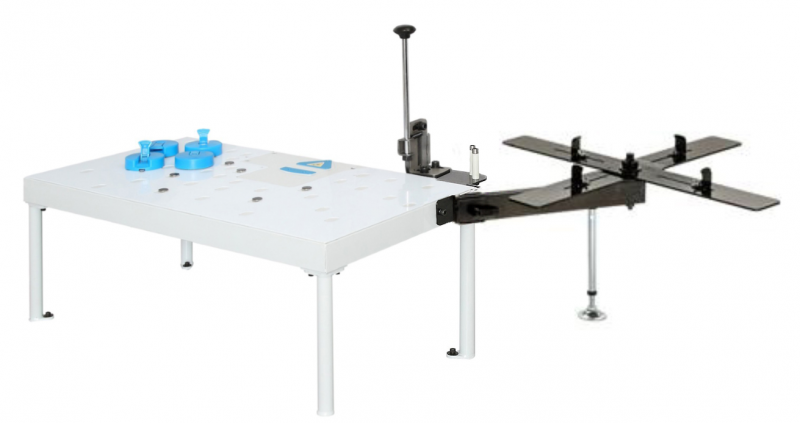 *The ST97 Fence Attachment also includes an attachment for the optional Trim Station Upgrade (ST95 table and PD80 Edgeband Trimmer) and 2 Moveable Frames (to span across the table) for a trim station and edgebander station.